Packaged Food Metal Separators – Foremost Machine Builders, Inc.
Our tunnel detectors are perfect for detecting metal contamination in packaged and non-packaged food products. Enclosed in a stainless steel housing, these tunnel detectors will completely surround a product as it moves along a conveyor belt or down a shute and passes through a magnetic field. Using a tunnel detector that scans the entire product ensures that any foreign metal material will be detected. If you’re looking for the highest level of sensitivity possible, we suggest the MPULSE BD tunnel detector which is mostly used for detecting metals in products moving down a conveyor belt. A contaminated product can be removed either manually once the belt stops or an alarm sounds or automatically using a rejection device. With its sensor and control unit housing made of sturdy stainless steel, this unit requires no maintenance even in the most challenging industrial environments. All of its internal electronic components are securely installed inside a second stainless steel enclosure which makes it easy to washdown. Capable of handling daily steam hose cleaning with maximum of 1000 psi, the MPULSE BD is perfect for those food processing plants where cleanliness is strictly enforced. We offer complete metal detecting systems consisting of conveyor belt HQ and the MPULSE BD tunnel metal detector. The belts are available as standard and customized equipment. A complete system can be ready for operation immediately after installation. 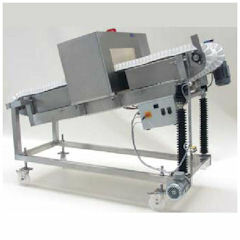 The HQ conveyor is made of sturdy stainless steel, appropriate for use in food industry. They are maintenance free and constructed for a durable operation in an industrial environment. All welds are ground and polished to provide a clean surface. Welded inserts in the support frame prevent water entry into the frame. All controls are conveniently located in one stainless steel enclosure. START, STOP and RESET buttons are located on the enclosure for ease of operation. Conveyors can be provided with special modifications for high pressure washdown applications. We offer complete metal detecting systems consisting of conveyor belt HQ and the MPULSE BD tunnel metal detector. The belts are available as standard and customized equipment. A complete system can be ready for operation immediately after installation. The HQ conveyor is made of sturdy stainless steel, appropriate for use in food industry. They are maintenance free and constructed for a durable operation in an industrial environment. During its operation, the settings of the tunnel detector have to be checked quickly and accurately. The BD model is very user friendly and comes with step by step instructions. Digital displays make it easy to read. To meet HACCP guidelines, most operators will check their equipment on a regular basis. This model will not only prompts the operator to test the detector at preset intervals, it recalibrates itself every time it is turned on. With all of its electronic circuits miniaturized thanks to the latest state of the art SMD technology and all its components mounted on one multi-layered board providing advantages in noise immunity and reliability, this unit promises years of reliable service. Capable of storing 3 products for recalling later on. Tunnel detectors can be used for monitoring packaged sandwich meat as it moves downstream from the vacuum-forming machine. They can be used on a cart-type oblique conveyor belt. All of this occurs independently from the conveyor belt speed and the size of the product and is automated by optical sensors. Our tunnel detectors can be designed to meet the technical details of the conveyor belts which are usually customer specific.